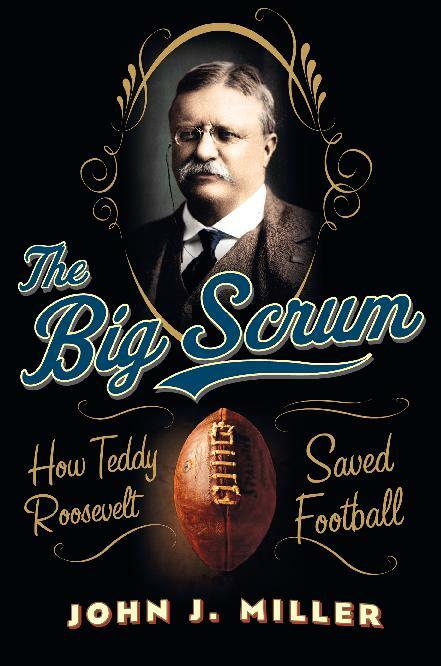 John J. Miller’s new book, The Big Scrum, chronicles how Teddy Roosevelt helped evolve the sport of football from an ultra-violent sport on the verge of prohibition, to America’s most beloved game. Roosevelt was an advocate for football when many universities, and even states, were considering abolishing it. Roosevelt contributed to major innovations in the sport such as the NCAA and even the forward pass. Miller is an accomplished author and has written for The New Republic, National Review, The Wall Street Journal, and is the contributing editor of Philanthropy magazine. The Legal Blitz interviewed him about this fascinating era in the development of football. We think of football now as a rough game, but it pales in comparison to the violence of the game around the turn of the century. Describe just how dangerous it was back then. In 1905, eighteen people died playing football. This was from the college level on down to the sandlot game. There were many more grievous injuries. Broken bones were common–almost unremarked upon. It was the deaths that attracted attention and helped spawn a prohibition movement that wanted to ban football. What drew Roosevelt to the sport of football? Why did he believe that its rugged nature was good for the country, and its young men? Roosevelt attended his first football game in 1876, as an 18-year-old freshman at Harvard. He watched the second-ever football game between Harvard and Yale. He enjoyed the sport as a fan. He didn’t play it himself–he was too small and wore glasses–but he appreciated it as a spectator. Over time, he became convinced of its social utility. He believed that rough sports helped turn boys into men by teaching them lessons they couldn’t learn from books. What role did Roosevelt play as an advocate for the sport as a national figure, and then as a President? Roosevelt was America’s first great sporting president. He was best known for hunting, but he was an advocate of the vigorous life in general–or “the strenuous life,” as he put it in a famous speech before becoming president. When football came under fire for its brutality, Roosevelt defended the game with conviction and eloquence. Yet he also recognized that football’s critics made valid points and he sought to accommodate them by encouraging reasonable reforms. Roosevelt’s primary foe in the preservation of football was Harvard University president Charles W. Eliot. Why did he find the game so objectionable, and what was his relationship like with Roosevelt? Eliot was probably the single most important person in the history of American higher education. When we think of Harvard as a great university, much of that comes from Eliot’s four-decade tenure, when he turned the school into a modern research institution. He also hated football, thinking it a game of violence and trickery that was not fit for gentlemen. He regarded it as unsporting, for example, for a team to receive coaching instructions from the sideline during a game–an odd notion to modern sensibilities, but one that Eliot really believed. Eliot was a generation older than Roosevelt and was president at Harvard when Roosevelt was a student. The two men never were close and Eliot was often skeptical of Roosevelt, especially as Roosevelt gained prominence in politics. Many involved in Progressive Era politics saw football as ripe for government intervention (or abolition). Describe how close football was to government regulation, and how it was ultimately avoided. In 1897, the legislature of Georgia voted to ban football. Can you imagine that? Georgia without football? The vote took place after the high-profile death of a football player. The politicians felt that they needed to “do something” and so they banned the sport. The governor was ready to sign the bill until the dead boy’s mother urged him not to outlaw a game that her son loved. So the governor vetoed it. But football almost became illegal in Georgia. The social movement to prohibit football thrived on incidents like this. It took the leadership of Roosevelt–and especially a football summit meeting that he held at the White House in 1905–to find a permanent solution to the problem of football fatalities. Roosevelt appreciated the rugged nature of football, but recognized that the extreme violence was a legitimate concern. Lawyers and policy makers often struggle to balance the freedom to participate in inherently risky activities, against the temptation to regulate to the point of extinction. How did Roosevelt walk this thin line? Roosevelt enjoyed football but he wasn’t a football player and regarded himself as an outsider–he didn’t feel qualified to dictate solutions to football men who knew the game much better than he did. He wanted football to solve its own problems and believed that his role was to encourage and cajole. As president, he commanded respect. Not everybody in the world of football wanted to change the game, but enough did and his intervention motivated them. In effort to reform football to reduce violence, Roosevelt and leaders within the sport created the NCAA. Tell us about the circumstances and results from this milestone event. The winter after Roosevelt turned his presidential attention to football, an alliance of schools formed a new football rules committee. This organization went on to become the NCAA. The members also passed a series of sweeping rule changes to football. Most important, they legalized the forward pass. Up to this point, there was no passing game in football–quarterbacks could make a lateral toss in the backfield, but they couldn’t throw the ball downfield. This rule change is what finally separated football from his rugby origins and made the game a distinctively American sport. The sport Roosevelt originally sought to preserve is hardly recognizable next to today’s game. Could it be argued that the first incarnation of football was in fact abolished, and Roosevelt’s efforts created a new sport rather than saving the old one? fundamentally different from those games as well. So Roosevelt’s era gave birth to a new sport but it’s a sport with a family tree. From what you’ve researched and written about Roosevelt, how do you think he would feel about new rules on illegal hits in the NFL? I have no idea what Roosevelt would think about today’s NFL rules, except to say that I suspect he’d be a fan of the game. He’d probably be a New York Giants fan. Are their any analogous controversies in sports today where we can draw upon Roosevelt’s wisdom? Perhaps Mixed Martial Arts? I don’t know what he would have thought of mixed-martial arts, either. He probably would have admired the physicality of the fighters but not their flamboyance. In many ways this is a story about the balance between regulation (government or otherwise) and freedom of the market. Regulations have obviously exploded since Roosevelt’s time with mixed results. What do you think he would say about our modern government’s role as a regulatory agency? Roosevelt helped give rise to the regulatory state but probably would be astonished by how much government has grown in size and scope since his day. This entry was posted in Articles, Q & A's. Bookmark the permalink.